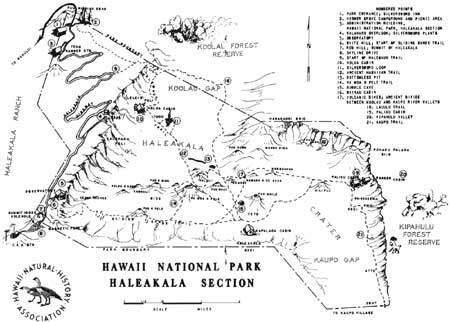 Web Edition Note: The online edition of this Hawaii Nature Notes is for HISTORICAL PURPOSES ONLY. Please visit Haleakala National Park for up-to-date travel planning information. 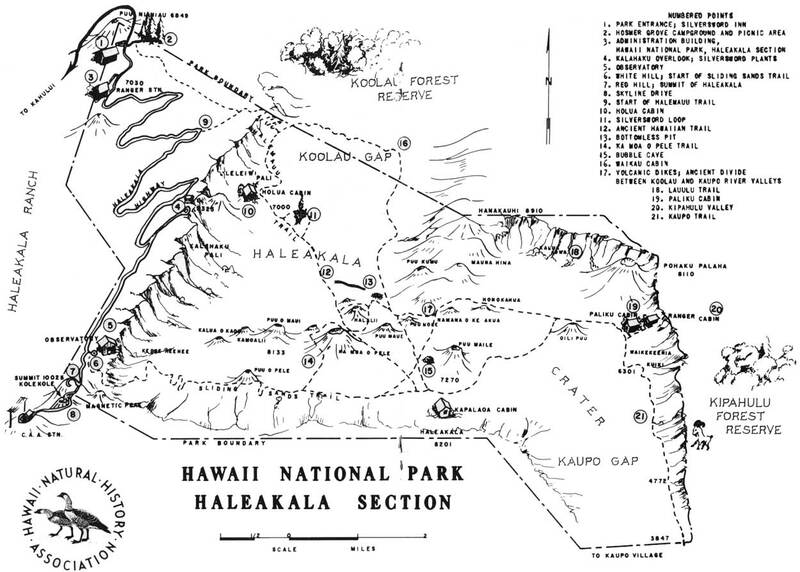 Basic data for this section was compiled by the park staff and submitted by Eugene J. Barton, Assistant Superintendent in charge of Haleakala from 1949-1955. 1. Park entrance (elev. 6,740') and inn: The park entrance, marked by a rustic sign, is on the slope of Puu Nianiau, an ancient cinder cone. Nianiau is Hawaiian for swordfern. One quarter mile above the entrance turn right to the Silversword Inn for meals, lunches, overnight accommodations, color pictures, slides, and souvenirs of the park. The inn arranges guided trips through Haleakala Crater. "Following the publication of this guide, the Silversword Inn discontinued operations in the park and is now located 12 miles from the park boundary on Highway 377. There are no food or lodging concessions within Haleakala National Park. 2. Ralph S. Hosmer Grove: Across from the lodge, a paved spur road leads to the Hosmer Grove Campground and Picnic Area. 3. Headquarters of the Haleakala Section of Hawaii National Park: Stop at the Administration Building beside the road for information, permits, cabin keys needed on crater trips, and for assistance in case of trouble or accident. The park maintenance area is located behind the station. As you drive toward the summit, note the small native trees and shrubs growing along the road. This elfin forest was all but destroyed by goats and cattle; it has recovered under National Park protection. The book, "Plants of Hawaii National Park," and the section on plants in this guide may help you identify the different species. These and other publications of the Hawaii Natural History Association may be purchased at the inn or at Park Headquarters. 4. Leleiwi Overlook; Kalahaku Overlook: At the switchback near the 9,000-foot contour, a parking space has been constructed that is labelled LELEIWI OVERLOOK. This is above Holua and the Halemauu Trail, so that parties can be watched as they go down Leleiwi Pali. On clear days, the whole length of Keanae Valley can be seen through Koolau Gap. The lateral view extends from Hana Airport across the big isthmus to Kihei on Maalaea Bay. On afternoons, clouds roll into the gap, making this a good place to see the Brocken Specter. One's shadowy image appears within a circular rainbow, projected against the bank of cloud. KALAHAKU OVERLOOK (elev. 9,325') is a remarkable view point on the crater rim that is reached by a short spur off the main park road. It is the site of the Old Rest House, in which travellers on foot or horseback stayed overnight before the road was built. Silversword plants may be seen just below the main parking area. 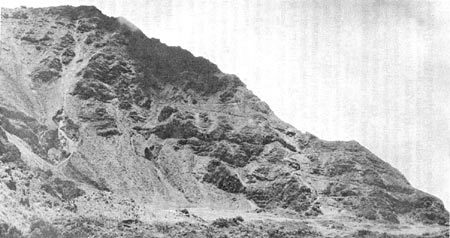 KALAHAKU is the name of the rugged pali forming the crater wall at this point. The name means "meeting place of the headmen or chiefs." 5. The Observatory commands a spectacular view of the crater near the summit of Haleakala. It was erected in 1937 by the National Park Service for your comfort and convenience. The observatory is the main objective of most visitors to Haleakala. Besides being a welcome shelter during inclement weather, it has a large relief map and interpretive orientation devices. Modern rest rooms are located to the rear of the building. 6. White Hill, Pakaoao (elev. 9,865'); start of Sliding Sands Trail: The rocky hill, just above the observatory, is capped with andesite, a volcanic rock lighter in color and different in composition from the common basaltic lava of Hawaii. The southwest slope, up which the trail leads, is covered with Hawaiian sleeping shelters consisting of oval stone-walled enclosures. These gave protection against the wind, fog, and cold that is common here. They may have been used long ago by wayfarers or by sentries and groups of warriors stationed at this commanding site. They may also have served as ambush for professional robbers, aihue, who waylaid travellers in lonely places. Refer to the topic, "The Tradition of Kaoao" in "Haleakala Hawaiiana" for more of the story. 7. Red Hill, Pakaoao, Summit of Haleakala (original English name, Pendulum Peak; elev. 10,025'): To drive to the summit take the paved road, turning sharply left below the observatory parking area. Red Hill is the highest of the three prominent recent cinder cones. Early morning is a good time to view extended panoramas and distant seascapes, before streaks of clouds form shelves along the sides of the mountain. But afternoon is better for viewing the crater, as its features appear in excellent light and color at that time. A pointer table by the road indicates the names of islands and peaks seen. An Army radar and radio communication station was located on Red Hill during World War II. 8. Skyline Drive: An improved driveway to the Civil Aeronautics Repeater Station leaves the park at the pass between Red Hill and Kolekole. Views stretch down the vast, precipitous southwest outer slope of Haleakala to the Lualailua Hills and a desert seashore, ten thousand feet below. Morning will most likely yield the cloud-free views. The Aeronautics Station is open to visitors. A parking area is just outside the gate to the station. Kolekole is the site of television relays and a satellite tracking station. It is a mile from the Observatory to the summit of Kolekole. It is 1.7 miles from the Observatory at the FAA Station. Magnetic Peak is across the road from Red Hill. A huge curiously shaped bomb on its skyline has a silhouette that looks much like a sitting duck. Halemauu Trail on Leleiwi Pali. 9. The Halemauu Trail starts from a curve on the park road at the 8,000 foot elevation. It leads down a gentle slope for eight-tenths of a mile to the crater rim. An alternate start is on the driveway into Hosmer Grove Campground, near Silversword Inn. Built by the National Park Service in 1937, the trail drops with a gentle grade down the 1500-foot Leleiwi Pali to the crater floor. It suggests thrilling trails in Glacier National Park and other rugged mainland areas as it swings and clings to the vertical cliffs. Hike to the crater rim for spectacular views of Windward Maui and Keanae Valley in fair weather; if clouds are rolling up Koolau Gap in the evening, you may possibly be greeted by the Specter of the Brocken. Silver geraniums, Hinahina, small spherical shrubs peculiar to Haleakala, grow along the upper trail and road. HALEMAUU, grass house, is said to be derived from one formerly located near the head of the trail. Volcanic bomb on Magnetic Peak. 10. Holua Cabin rests in a grassy plot at the foot of the towering, 3,000-foot Leleiwi Pali. Introduced grasses grow in the meadow near it. The pale "moss" on the rough lava flow is Stereocaulon, actually a lichen, that strange combination of an alga and a fungus growing together to appear as one plant. This pioneer on barren new lavas is sometimes called Hawaiian Snow. The comparatively recent flow in front of the cabin contains lava tubes or caves. These are rough and dangerous, and should not be entered except by especially equipped parties. Holua Cave, above the cabin, was used as a night shelter before the cabin was built. 11. Silversword Loop, a quarter-mile long, deviates from Halemauu Trail past several clumps of silversword. Hollows and slopes of the old, weathered, red lava flow in this area have favorable conditions for their growth. Near the east end of the loop, the main trail passes among many piles of stones, ahus, markers, and platforms built by the Hawaiians. This place, known as KEAHUOKAHOLO, appears to have had special or sacred significance. State law, as well as Hawaiian customs and ethics, strictly forbids disturbing or damaging any of these ancient structures. 12. Kihapiilani Road: From a black, cinder-covered flat, an old Hawaiian pathway crosses the rough shoulder of the small cone on Halalii to smoother surface between Mamane Hill and Puu Kumu. It is six to eight feet wide and is paved with flat stones. The start, difficult to locate, is to the right of a small, horned spattercone seen from the trail as you look toward Hanakauhi Peak. A chief, Kihapiilani, built the trail over Mauna Hina along the North Rim to a pond, Wai Ale, probably the present Wai Anapanapa on the exterior slope. Refer to "The Legend of Kihapiilani" in "Haleakala Hawaiiana" for the story. 13. Bottomless Pit is a yawning black well, ten feet in diameter, rimmed with colored lava spatter a few feet high. Use caution approaching its edge. Baseless legend claims that it sinks to sea level. Although no bottom can be seen, debris chokes the opening sixty or seventy feet below. It is a vent, through which superheated gases were emitted in an eruption of long ago. The rim around the throat indicates that a little lava sputtered out with the gas. During the flank eruptions of Mauna Loa and Kilauea similar vents exhale columns of blue, incandescent gases at intervals. Old Hawaiians at Kaupo say that the pit was used for disposition of umbilical cords of babies. Various reasons are assigned to the custom, such as to make the child strong, or to prevent its becoming a thief. 14. Ka Moa o Pele Trail branches from the foot of the Sliding Sands Trail to join the Halemauu Trail across the crater. It is a scenic route between silverswords on Ka Moa o Pele, a red cinder cone. Flowering plants can usually be seen from June to September. Pa Puaa o Pele, Pele's Pig Pen, is the rim of a spatter cone, now buried, in the low pass between Halalii and Ka Moa o Pele. Hikers from Sliding Sands to Holua should go around the right or east side of Halalii to see the Bottomless Pit and Pele's Paint Pot, a colorful pass just a short distance beyond. 15. Bubble Cave is a large, collapsed bubble with heavy walls. 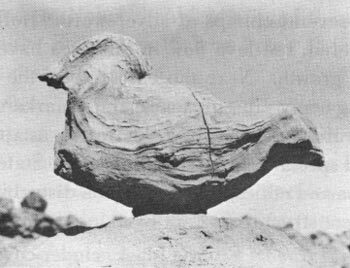 It was blown by gases in ancient molten lava. Only a small segment collapsed in the center of the roof, which serves as entrance and smoke-hole; old-timers were wont to camp in this natural shelter. It was the rest stop now supplanted by Kapalaoa Cabin. 16. Wailuku Cabin, outside the park, was built by the State Board of Agriculture and Forestry for the use of hunters. Arrangements for its use must be made at the Maui Office of the Board in Kahulni. Trails to it are not of park standards and are not recommended to sightseers. 17. Old and New Volcanics: Dikes that protrude as slabs of light-colored rock from slopes of the ridge toward Hanakauhi mark part of the ancient divide between Koolau and Kaupo Valleys, the great erosional canyons worn into the mountain during an age of quiescence. This divide is deeply buried inside the crater under the cinders and flows of renewed eruptions that form the present floor. Adjacent Mauna Hina and Namana o ke Akua, green with shrubs, grass, and scrub mamane, are cinder cones from ancient eruptions. Puu Nole, a garish, black youngster in the community, has only silverswords on its barren slopes. Towards Paliku the trail is flanked by some of the most recent lava flows, only a few hundred years old. Their source vents are visible on the slopes of Hanakauhi and the north wall of the crater. 18. Lauulu Trail is plainly visible as it zigzags up the north wall. Although not maintained at present, it is passable and allows rugged enthusiasts to climb the rim for views of the crater. On the outer slopes, moist grassy plots, often fog-bound, blend into jungle that drops to the Hana Coast, 8,000 feet below. Kalapawili Ridge extends from the summit of Hanakauhi Mountain eastward around the head of Kipahulu Valley to the tiny lake, Wai Anapanapa. It is readily traversable for the good hiker. 19. Paliku is very different from the desert wastes in the other parts of the crater. Lush grass and ferns, overhanging forest trees, and a verdant cover on a towering pali result from abundant clouds pushed by the trade winds over the east wall. AKALA, the giant Hawaiian raspberry, ripens abundantly back of the cabins in July. It is excellent for pie, conserves, or dessert. Native Hawaiian trees include: MAMANE, far larger than the scrubby growth in the crater; OHIA, with gray-green leaves and red lehua flowers; KOLEA, with thick magnolia-like leaves four inches long; OLAPA, with leaves that tremble in the slightest breeze, like those of quaking aspen. The conifer above the Ranger Cabin is a cryptomeria, a Japanese evergreen planted early in this century. 20. Kipahulu Valley, beyond the eastern rim, is a remote, jungle wilderness walled in by loftiest cliffs; a no man's land, it has barely been explored, let alone touched or altered by civilization. Look from the cabin at Paliku across the pasture to the lowest notch in the sheer eastern pali. For a view into Kipahulu, a good climber can follow an old goat trail, steep and tortuous, that leads up the left side of the draw to this notch. A chorus of bird songs rises from the primeval forest in Kipahulu. With them you may hear complacent squeals of wild pigs that have been undisturbed for generations. 21. Kaupo Trail is a good trail that winds down Kaupo Gap, across little meadows, through groves of small AALII trees, and under spreading KOA trees to the park boundary which is below the 4,000-foot contour. Wild goats may be heard on the pali or on the lavas in the gap. 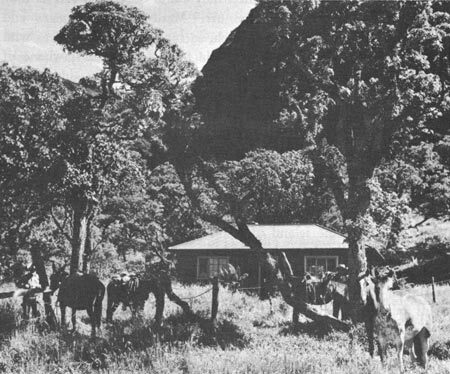 Kaupo Ranch extends below the park. From the redwood water tanks, a jeep trail descends through pastures to ranch headquarters. It is 8 miles from Paliku to ranch headquarters, which can be hiked in a half day. Kaupo Village on the belt road around Haleakala is 1-1/2 miles further. The route is interesting, but arrangements must be made in advance to be met by car either at the ranch or the village. It is fifty miles from Central Maui by the shortest road. Although Kaupo Trail crosses private property, advance permission is not required to use it; but, in due consideration, please use care to close gates and do not molest or damage any property. The reverse trip from Kaupo Village into the crater is not recommended because of the long, arduous climb up the unsheltered, south-facing mountain slope.